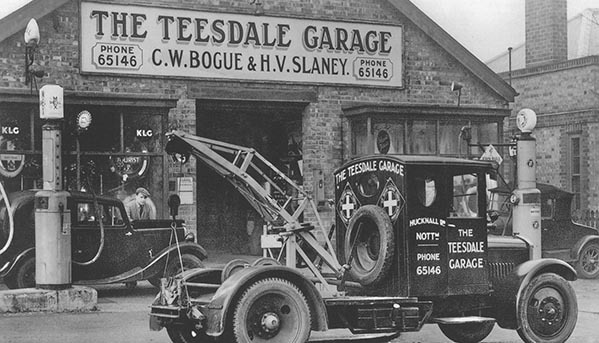 This is a typical garage scene from the 1920’s. Sadly, long forgotten. 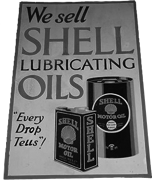 Once when the motorist stopped for Motor Spirit and Oil they were greeted by all manner of manufacturer’s signs, light boxes and lit petrol pump globes, promoting their individual logos and products. Today, automobilia from this bygone era is eagerly collected by those with a passion for the past, an appreciation of colour and design and a desire to obtain the rarest survivors. I have been collecting automobilia, enamel signs, petrol pumps, racing posters and photographs for over 30 years. There has been a huge growth in interest from new collectors and values have risen considerably as a result. As this new investment has been recognised, the increase in the manufacture of reproductions has grown with it. So be aware and be very careful ! Start now and begin to create that vintage look in your own garage. I’ll look forward to talking to you. 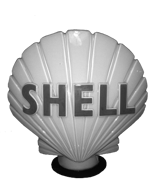 Rare Shell Oils pennant flag enamel sign.